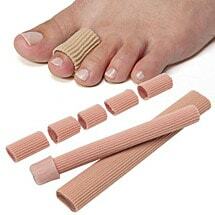 Cushion calluses, corns, ingrown nails, blisters or other painful toe maladies with these easy cut-to-fit gel tubes. The gel layer inside is infused with medical grade, mineral oil which helps soften skin and soothe toes. These washable/reusable gel tubes stay in place without adhesive while the soft knitted gel fabric protects tender toes. Two tubes per pack will make up to 15 toe tubes. Choose wide for big toe. Set of 2.